Manufactured from aluminium with a brown coloured finish and subtle sheen, the aluminium cubicle headrail features a curved design offering long-term value due to the corrosion resistant properties. Suitable for installation onto 13mm board, the toilet cubicle headrail measures 3m in overall length. To complete the appearance of the single toilet cubicle headrail, we advise an additional order of the T991BR-F1end caps which are sold separately. 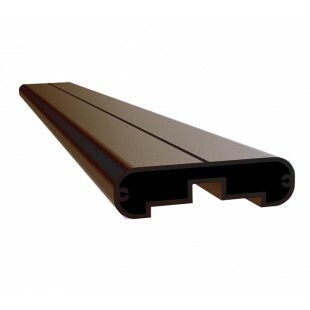 The end caps will seal the ends of an aluminium cubicle headrail featuring a curved design.